IDIOTIC truckies in overweight vehicles are still jamming and blocking motorway tunnels despite easily obtainable maps showing them how to avoid getting stuck. Even though Roads and Maritime Services distributes Restricted Access Vehicle maps detailing designated routes for overweight vehicles and showing locations and heights of all Sydney's tunnels and bridges, drivers are ignoring the information. There are about 50 incidents each year involving overweight vehicles blocking traffic because they cannot fit through a tunnel or under a bridge. 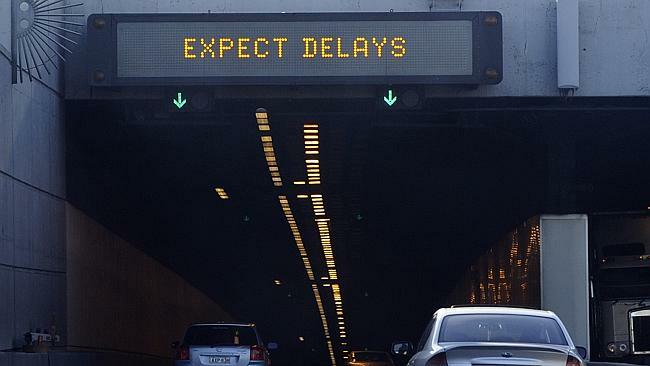 Tens of thousands of commuters were delayed by up to two hours on Thursday when a tip truck smashed into the roof of the M5 East tunnel at 8am. 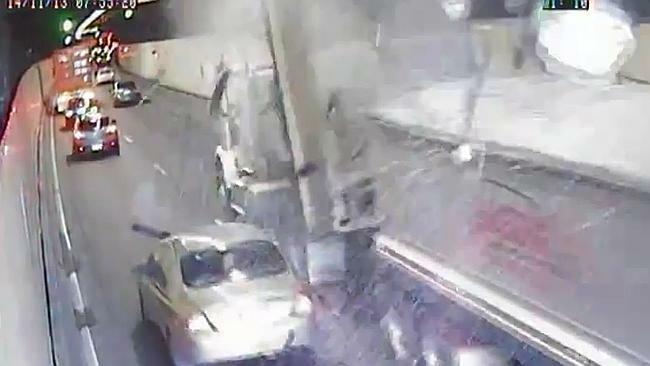 The chaos increased at 9.30am when an overweight truck was stopped entering the southbound lanes of the Harbour Tunnel. It was closed for 15 minutes. At 9.40am, a heavy vehicle caused the closure of the Harbour Tunnel northbound for about five minutes. The state's peak trucking organisation blames the incidents on a poor grasp of English among many heavy vehicle drivers and drivers not being taught about overweight vehicle restrictions while they are going for their truck licence. But the Transport Workers Union said drivers are making mistakes because trucking companies put pressure on tired and overworked drivers to take risks to meet delivery deadlines. Are vehicle height restriction signs on tunnels clear enough? As well as the RAV maps, the RMS has a brochure, Driving Overheight Vehicles, which details the location and heights off 22 tunnels in NSW, including Sydney's eight Motorway tunnels. Under RMS rules a heavy vehicle is overweight if, together with its load, it is more than 4.3m high. Loads measuring higher than 4.6m must apply for a special permit. The lowest Sydney tunnels, including the Harbour, Cross City, and Eastern Distributor tunnels, have a clearance of 4.4m. The manager of truckers representation organisation Australian Trucking Association NSW, Jodie Broadbent, said it has had discussions with RMS about the lack of English language skills among drivers. "A lot of truck drivers in the Sydney metro area are from an ethnic background, or from a low education background," Ms Broadbent said. "They may look at the height restriction signs and may not understand what it is actually saying. "We've recommended they have pictures rather than words alerting the drivers. It keeps it simple." Ms Broadbent said many drivers are ignorant of the height restriction rule because companies that are not members of the ATA tend not to get the information to drivers. "Whether it's an excavator on the back of a truck or piece of steel sticking up in a scrap metal bin, a lot of it is drivers just not being aware of what their load is doing and how high it is. Irresponsible drivers are giving the whole industry a bad name." Pictured is the city bound entrance to the Lane Cove Tunnel on the M2. A spokesman for the TWU's NSW branch blames tunnel incidents on pressure from trucking companies on drivers to take risks and skip rest breaks to meet delivery deadlines. "What we already know is that truck drivers are being placed under increasing pressure to hurry and skip rests and take risks and unfortunately this can lead to mistakes," the spokesman said. The TWU said an industry survey last year showed that 46 per cent of heavy vehicle drivers were pressured to drop their rest breaks to meet delivery times. "We have to reduce this pressure on drivers through action in the Road Safety Remuneration Tribunal, which sets safe rates of pay and conditions in heavy vehicle transport," the spokesman said. A tip truck entered the M5 tunnel with its tray lifted. The tray hit the roof of the tunnel, obstructing traffic for kilometres. "We also have to stop the Abbott government's planned review of the Road Safety Remuneration Tribunal, from closing it down. "If the Road Safety Remuneration Tribunal closes we'll see even tighter deadlines, poorer maintenance and more pressure on our drivers - and that can only mean more tunnel blockages." ATANSW has suggested to RMS that lessons on overweight load rules and restrictions be included in the heavy vehicle drivers' licence test. "Drivers should be given tools in that training about what they can do to measure the height of their vehicle and what their responsibilities are under the legislation," Ms Broadbent said. She said the RMS should consider installing sensors ahead of tunnel entrances to alert drivers through their radios that their load is overweight. "But, at the end of the day, some responsibility has to come back to the driver." Heavy traffic warning at the entrance to the at M5 Tunnel at Mascot on Thursday. 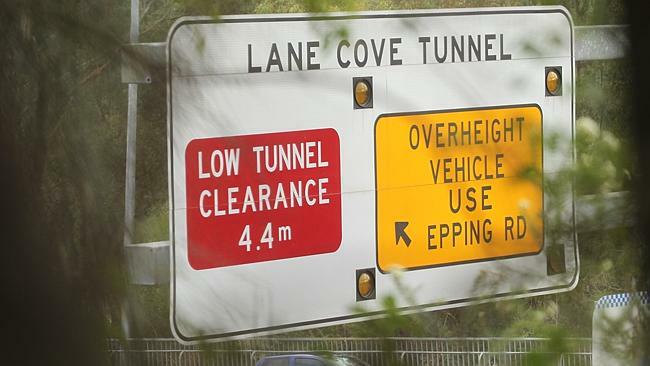 Roads Minister Duncan Gay said the toughest new penalties in the country for overweight vehicles, introduced in July, should be a deterrent to driving into tunnels with a high load. "Drivers of overweight vehicles face a fine of more than $2200 and six demerit points, plus we can ground a truck by suspending registration for three months," Mr Gay said. "If you are driving into one of our tunnels, you make damn sure you are doing the right thing because we will come after you with every penalty we can. We can also pursue transport companies with fines of up to $27,000 for a first offence and $55,000 for second offences. "These fines are in addition to compensation we can pursue for damage they have caused to the tunnel and associated infrastructure. "Not only are these drivers putting themselves and other drivers in danger - it's plain idiotic given the fines and penalties that result for them and their owner operators."